“Sight Unseen”, an unprecedented film about a blind football star, is inspired by the stories of blind football players, who were one hundred percent blind and played in high school football games. Our hero,"Mitchell" not only starred in, but also became an integral part of a victory in the most important game in his school’s history. But this is not just a story about a teenager playing football blind. It is a story about people: A friendship of epic proportions, a coach who endures both ridicule and frustration, teammates in turmoil, a family who stands behind their child, and teenagers falling in love - all surrounded by a society that refuses to accept. This is a story about human emotions – about the challenges, victories and defeats in a spectacular journey that takes Mitchell from the light of his early youth, through the darkness and despair of his tragedy, and then back to the light again. We will laugh, cry and love with him. We will jump, run and tackle with him. We will feel every collision on the field, and every emotion off the field. For the first time in the history of the Motion Picture Industry, through a unique use of sound, we, the audience, will see through the eyes of a blind man. We will share his goals, his defeats and his triumphs. We will feel his rage, his pain, his fear, his frustration, and even his love for a woman. In the end we will truly understand, that yes, it is possible for a blind man to play football – and - yes, it is possible for a blind man to see. Mitchell Austin was born on December 15, 1955, a normal child with perfect vision. Early on in his childhood in the Illinois town of Kodiak, Mitchell demonstrated his potential to become a great athlete. He was always a little faster, a little stronger, and much more determined than the children around him. At the age of five, while playing with his best friends, his life was changed forever when he was struck in his right eye by a rock. Through a related bacterial infection, his left eye slowly went blind over a period of eight years. At the tender age of six Mitchell prepared himself for a life of darkness. Whether it was his mother’s smile, thunderheads rising in an angry sky, the Detroit Lions playing the Green Bay Packers on Thanksgiving day or the lone tree in the field where the kids played football, each day he would memorize something new. He would sit for hours staring out the window, watching the sunset at night and the sunrise in the morning, memorizing the beauty of each and every color. In the first few years, he lost the ability to see colors. Shapes and forms were the next to go. By the time he was ten, he could only distinguish light from dark. Once the last color finally faded from his life, he prepared himself for inevitable total blindness by counting steps, measuring distances, memorizing landmarks, and listening to sounds and echoes. One extremely bright winter day when he was walking the half-mile home from the school-bus stop, through dazzling white snow, Mitchell became disorientated and felt truly helpless. For the first of only two times in his life, Mitchell was not able to cope with his blindness. He eventually was saved by the distant barking of his dog, which taught him the importance of sound. Throughout his childhood, Mitchell refused to accept the label “Handicapped”, demanding to be treated as a normal kid. He continued to pursue his love of football and played for hours with the kids in his neighborhood. He practiced for hours with his best friend, Sean Jackson, using a numbering system and counting steps when he played tackle football with the kids on the open field in his neighborhood. When Mitchell played in those sand-lot football games, Sean would throw a football to a particular location and Mitchell would count his steps, listen to Sean’s directions and to the amazement of his friends, more often than not, catch the pass. During this time he had many run-ins and fist-fights with a neighborhood kid named Paul Barrows, whose parents blamed him for Mitchell’s blindness. In school, Mitchell was forced to go to Braille classes and sit with other blind and handicapped children who were withdrawn and timid and treated cruelly by “normal” kids. He resented the cruelty and vowed never to consider himself lesser than people who were not blind. By the eighth grade Mitchell was allowed to return to regular classes where he discovered his talent for wrestling. Mitchell never really knew the exact day when it happened, but by the eighth grade, his blindness was complete. He never told anyone but his sister that his sight was completely gone, and he used the sound of other student’s voices and echoes of his feet off the hallway walls to get around, but he was forced to give up other sports and concentrate on wrestling. His wrestling ability earned him the respect of his peers when he made the high school wrestling team. Mitchell was always comfortable with his blindness, and went through the normal trials of high school adolescence, including girls. By the end of his junior year, he found himself standing outside of the football coach’s door, knocking. With that first reluctant knock on Coach MCKillop's door, Mitchell’s life changed forever. After convincing the head football coach that he wasn’t joking, Mitchell had to overcome the resistance of the other coaches, his doctor, his mother, the principal, the School Board, community leaders and his skeptical teammates, in order to make the team. It was an unprecedented goal and no one seriously thought he could do it, but Mitchell’s discipline in wrestling and life in general carried over to football. Mitchell’s biggest challenge was the first time he put on his football helmet, which distorted the sounds that he relied on so much. The episode with his helmet was the second and last time in his life that Michael became frustrated with his blindness, but with help from Sean Jackson and his usual determination, he soon overcame the problem. Throughout the season, with the selfless help of Sean, and despite the sabotage of teammate and star lineman Paul Barrows, Mitchell continued to improve and finally impress, drawing not only local media, but also publicity from across the nation. His dream of becoming a starter was constantly stymied by Coaches McKillop and Lucas, who despite admiring his amazing abilities, were afraid of the possibility of serious injury, and therefore were both hesitant to let Mitchell play for more than a few minutes of the last quarter. But Mitchell’s family was constantly at his side, supporting his every decision. His father, who inspired and helped him throughout his tragic childhood, never flinched when he discovered Mitchell wanted to make the team, and together with his sisters, helped Mitchell’s mother understand why it was necessary to support him in his quest. Kathy was there for him also. During their courtship, Mitchell and Kathy shared a friendship that could only happen in Middle-America in the seventies. Their relationship grew from a secret distant admiration to one of a naughty and innocent love. The interpretation of their moment alone on homecoming night is a love scene that should be remembered forever. When given his chance in the homecoming game, Mitchell started and starred in the final championship contest against an undefeated rival and a three-hundred and twenty pound adversary, thus becoming not only a vital factor in the victory, but also a legend in the lore of Illinois football. During that historic weekend, Mitchell’s twelve year feud with rival Paul Barrows finally ended with a sincere friendship. Mitchell Austin, larger than fiction, is a true American Hero. 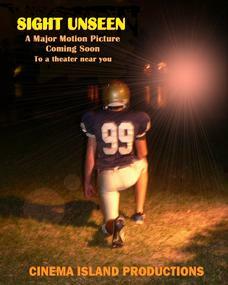 Come see for yourself, as - with the expert advice of some of the blind football players themselves, and the revolutionary use of 4-D sound, enhanced by music of the late sixties and early seventies – you will be presented with a truly uplifting and inspiring Major Motion Picture, “Sight Unseen”.